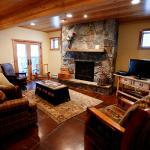 Walking Bear Lodge is a holiday home located in Whitefish. Guests can enjoy the on-site hot tub and outdoor fire-pit. Amenities at Walking Bear Lodge include an outdoor barbecue area flat-screen TVs with premium channels 2 fully-equipped kitchens 5 bathrooms and several fireplaces. Glacier National Park is only 25 minutes' drive away while Whitefish Mountain Resort is only 20 minutes' drive. The nearest airport is Glacier Park International Airport 6 km from the property.